The K-750 is a powerful‚ self-contained machine ideal for lateral lines. The power feed system advances and retrieves the cable automatically up to 20 ft/minute. The versatile power feed adjusts for 5/8" or 3/4" cable with a twist of a screwdriver. 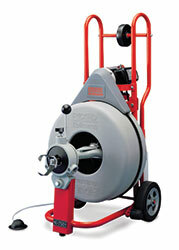 The K-750 comes with 3/4" cable‚ which is recommended for 4 to 10" drain lines up to 200 feet. Use the optional 5/8" cable for 3 to 6" drain lines also up to 200 feet. The drum holds 100 ft of 3/4" or 125 ft of 5/8" cable‚ and withstands harsh treatment and abuse. It is designed for quick‚ easy removal. Its tough‚ corrosion-resistant body will not dent and cleans easily. The K-750’s well-balanced design gives this machine a lightweight feel. A transport wheel eases loading into a truck or van.